Ashbourne 2015 from Anthony Hamilton Russell and team is the first release under this label since the 2010 vintage and whereas previous incarnations of the wine were Pinotage-dominated blends, it is now entirely from Pinotage. Fermentation involving 10% whole-bunch, the wine was matured for 11 months in 400-litre barrels, 40% new and then for a further five months in 2000-litre foudre. On the nose, plum and dark cherry as well as earth, vanilla and spice plus a varnish-like note. The palate has a nice vinosity about it – fresh with a long and savoury finish. It’s a somewhat peculiar wine as serious Pinotage often is. Price: R750 a bottle. The maiden vintage, 2001, was 100% Pinotage. AHR appears to be aiming at something he has in his minds eye without exactly finding it. Thus source of fruit is changed, various varieties are blended in and blends change. Then there are the missing vintages when presumably he feels the target has been missed by too far. He’s a perfectionist. I hope he gets to his destination. I would just like to clarify a few things about the Ashbourne Pinotage. The Pinotage has always been from a single vineyard in the Hemel en Aarde Valley. Although the vineyard will change, the plan is to always use fruit from clay-rich, cool climate vineyards in the Hemel en Aarde Valley for this wine. It was 100% Pinotage from its maiden 2001 vintage until 2006. Some vintages (2002, 2003 and 2006) were not released because we were not satisfied with the oaking of the wine. From 2007 until 2010 the wine was predominantly Pinotage with small percentages of Bordeaux varieties and Shiraz blended in. 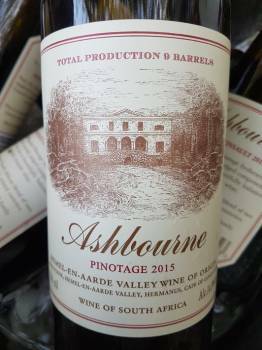 The reason for this was that we did not want the Ashbourne Pinotage to compete directly with the Southern Right Pinotage at that stage. We decided to change back to a 100% Pinotage in 2015 with a wine that we are really proud of. The 2016 and 2017 vintages of this wine are also looking very good. The 2017 Pinotage/Cinsault is an unwooded wine from the Swartland and stylistically completely different to the more structured Ashbourne Pinotage from the Hemel en Aarde Valley. Although we are equally excited about both wines (and Pinotage in general) we believe that with the Ashbourne Pinotage we are on track to creating an age-worthy, collectible wine with a sense of place. Thanks again for taking the time to comment on our wine! But what happened to the vintages 2011 – 2014? We were rethinking our strategy with the wine and although we did make small experimental batches, they were never released. The cost of holding on to a vintage for 5 years before release did not make sense anymore. We decided to wait for the next great vintage to release the wine as a 100% Pinotage again. I think the wait was well worth it and we are very proud of the 2015.